Get your hands dirty with Gas Engine Magazine! If gas engines are your hobby, then Gas Engine Magazine should be part of your toolbox. 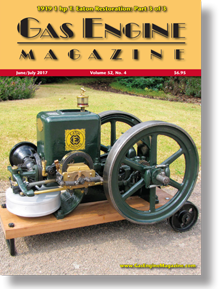 Gas Engine Magazine offers a lively mix of practical, hands-on information and in-depth articles about antique engines, restorations and shows. Subscribe and connect with more than 23,000 other gas engine collectors and build your knowledge, share your passion and search for parts, in the publication written by and for gas engine enthusiasts! Simply fill in your information below to receive 1 year (6 issues) of Gas Engine Magazine Print subscription for only $30.00!